(Originally published as story of the month at Third.Goal.org). After living it up one night, I sat alone on my front porch pondering a life of tomorrows because my departure was imminent. An adventurous, altruistic pursuit below the equator had beckoned to me. I was was 24 years old, and felt hesitant to leave the hometown I knew so well for so much of the unknown. Sunset Lake came to mind: swimming, and catching fish, frogs, and turtles; skating, generating eerie echoes underneath the ice—thoughts of my youth. And for kids with an edge, there was skid-hopping, a/k/a bumper-jumping. We knew the best corners to dart from to grab the car’s back bumper and squat for this horizontal street-skiing. One time, my gloves got stuck in the bumper and seemed to wave bye as I tumbled away. Luckily, that car returned and I got my gloves back. Yeah, skid-hopping was childish and stupid, but hey, I was then a child and sometimes stupid. When my friends missed the bumper or fell off, I’d keep going, sometimes reaching an intersection where I’d release the bumper, stand, and slide with bravado toward a neighboring pride of skid-hoppers. Once, the rear wheel of an old Dodge ran over part of my knee, but the snow cushioned it. I was unfazed and bragged about it the way boys do, with perceived invincibility. Some sense of that invincibility remained as I faced the risk and uncertainty of the Peace Corps. The United States Peace Corps, with uniforms ranging from jeans and T-shirts to world apparel of all sorts. No chevrons please; sarongs and safari shorts it was. A letter had confirmed that I “ship out” next month. Nervous energy compelled me off the porch to walk. It was after 4:00 a.m., and no one was around. The houses reflected our middle-class town, a dozen miles south of Boston, where the lawns were more likely to be manicured than the owners’ hands. Leafy limbs beneath the streetlights cast artificial shade onto the sidewalk. Between branches appeared glimpses of the Braintree Highlands water tower ahead. The previous summer, I’d been a member of the crew that sandblasted and painted the tower. It was set atop a hill, and the panoramic view was awesome. A tall chain link fence cordoned the tower. Well, maybe for old time’s sake . . . I climbed, carefully got over the barbed wire, and landed on the grass. The built-in steel ladder started thirty feet above the ground. Normally, you’d need another ladder to get to that one. Instead, I grabbed one of the diagonal crossbars that ran between the five tower legs. I shimmied up, grabbed the bottom rung of the ladder, and pulled myself up. The bulbous tower loomed, and I saw the narrow platform far above that ran its girth. As I climbed, the temperature seemed to drop because of the breeze entraining my perspiration. Trees began to look like broccoli. At last, I reached the platform and walked all around it, seeing for miles and miles in every direction despite little light from the pre-dawn sky. I grabbed the upper ladder section and climbed. The ladder was not encaged here, and I wasn’t wearing a safety harness. A slip would be fatal. Following the contour of the tank, the ladder became horizontal at the apex. I reached the final rungs and sat on them. My white-knuckled grasp relaxed as I caught my breath and puffs of wind caressed my face. I felt on top of the world. To my left, the country slept. To my right, the several rivers and the Boston Harbor reflected the pink, pre-sunrise sky. It seemed fitting to see so much of my growing-up grounds all at once, for I’d see none of it over the next couple of years. It felt good to ponder my mission, helping people on the other side of the world, and my assignment, teaching at a technical institute. Brighter sunbeams leaned over the saltwater and earthen horizon, gently tapping the sky awake. Peacefulness permeated the soft morning air as God opened his fingers on our side of the globe—let there be light! The sun broke the horizon. Beautiful. Then a distant siren disturbed my tranquility. It didn’t sound like a police car. A fire truck; yes, there it was. However, scanning 360 degrees, I didn’t see any fire. The fire truck should pass by on Route 37 nearby, though, so I could track it. It was probably a false alarm anyway. Oh, oh, it’s slowing—damn. Is it . . . ? Yes, it’s coming to this side road. It must be me! Could it be? Oh my God! Should I hide? If I lay flat, they probably won’t be able to see me. No, I’d better start climbing down just in case . . . In case a crowd gathered—I couldn’t stand that. I began my descent, carefully, determined not to rush. If they came because of me, I’d rather explain myself than fall and have “Why’d he do it?” whispered repeatedly at the wake. The fire truck stopped at the fence. I heard another fire truck siren. Then the accelerating rev of a smaller engine preceded the appearance of Braintree’s finest; and a second police car arrived. I heard doors opening and closing. I dared not take my eyes from my hands as they clenched successive rungs, each timed with my footing. Yes, I did dare; I just had to see. I slowed and peaked below. Unbelievable. Their police uniforms and fireproof rubber suits went to and fro among vehicles and at the gate, quickly advancing—to me, frightening blue and yellow streaks as I glimpsed down intermittently. Halfway down. Oh, man! What am I going to say? The second fire engine pulled up—no, two more fire engines, their shrill brakes broadcasting maneuvers, surely waking the neighborhood. The gate was unlocked and opened. Several men came through but not in a rush, and most hung back. Why? Was I just another nut to them? Or did they think I was dangerous? Too late to try to run. Not that I would—I’m not a kid anymore. A fourth fire engine arrived. I couldn’t believe it. Almost there. One cop and a couple of firemen watched me from inside the fenced-in area. Several responders were by the gate, and some were in or near their vehicles. A fireman approached below, but stayed a healthy ten yards from where I could possibly land. Another fireman joined him. This was embarrassing. What could I tell them? That my life was at crossroads? That I’d just been thinking? That like Henry David Thoreau—who peculiarly isolated himself at Walden Pond for a pensive period—I chose to live life deliberately? Yeah, right. At the end of the ladder, I slid down the pole to earth. Standing, I dusted off my hands as he ambled closer. Surprisingly, I wasn’t apprehended right away. “What were you doing up there?” he asked. He was watching me warily, probably to find signs of drug or alcohol use, or weapons, or even poison. Things I’d check for if I were in his rubber boots. Sensing incredulity, I had to spill it out. “Yeah. I, ah, I worked here last summer after college. 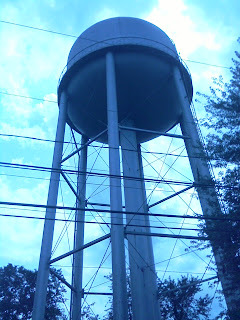 When it was painted, the water tower. I painted, tended the pot—um, you know, the sandblasting pot—and, and stuff.” I shrugged. “Where do you live?” another fireman asked. “On Wildwood, just down there.” I pointed longingly in that direction. The other cops hadn’t moved in, but they glanced around and whispered to each other. I just can’t get arrested! This is crazy. “In fact,” I offered, “I live with my mom. She works for the Water Department. Sure hope she doesn’t hear about this. She’d be pretty embarrassed, I guess.” I hoped the Peace Corps recruiters at the Boston office wouldn’t hear of it either--they could retract their invitation. One cop walked up to the second fireman and quietly got the scoop from him. I looked away, as tact was important. I recalled a recruiter’s comment on how important tact and negotiation skills would be in foreign contexts. And this context certainly felt foreign to me. “He’s a Braintree police officer.” Where, who—same difference. “Well, here he is now,” another officer said with a nod toward the street. We all looked through the chain link fence. Coming out of the fourth police car was my cousin Brian. What incredible timing—arriving exactly at that moment; it was kind of surreal. He was looking over at us, but I couldn’t read his face. He walked along the fence and passed through the gate, thumbs hooked on his leather police belt. After I explained everything, red-faced, they let me go. Walking home, I glanced over my shoulder at those flashing red and blue lights. When I turned forward again, I smiled. It was a healthy smile, I realized. I was ready to leave Braintree behind and face my future, which I believed to be bright. I was ready to see the other side of the world. “To have the Quran burned at a mosque is equivalent to having a cross burned at a black church,” said . . . Article about incident in MI etc. Crossing the line - when you bring "free speech" to someone else's back yard. Is it a comparable hate crime? Fans of my writing instructor Robert Everz might protest burning his novel, Burning Garbo, but religious books are in a "higher" category. Isn't it sacrilege for a pastor to burn a Koran? It seems like using Jesus's hand to slap both cheeks of others, perhaps literally adding insult to injury; and the Koran builds on Judeo-Christian tradition. When does freedom of expression and religion become more evil than good? Hey, I'm adding a third catagory to collect some material from some funny bastards I know out there. I'll be hunting you down if you don't volunteer or make a suggestion. Mwah ha haaaaaaa! Someone call 911 before this gets out of hand. First, if you left the planet briefly like me and aren't up on this controversey, click the link for a quick background. Are loyal Americans sticking up for the victims at Ground Zero in Manhatten? Or are they becoming haters by hating the haters? Allowing vs. not allowing - what are da merits and what are the demerits of each?